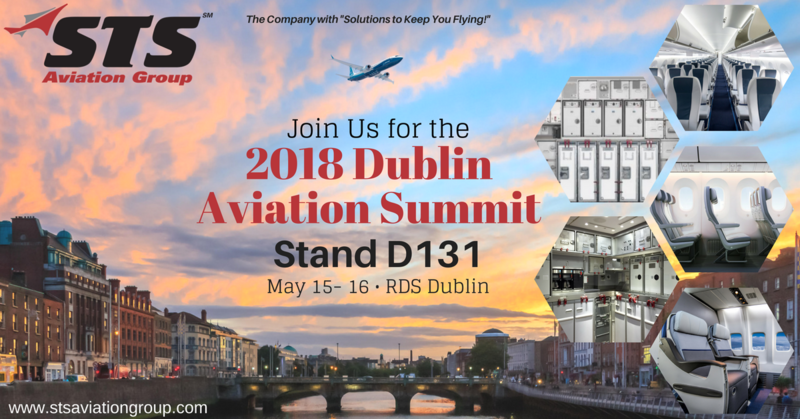 STS Aviation Group Takes Off for the 2018 Dublin Aviation Summit! The Dublin Aviation Summit gathers decision makers from industry leading MROs, Asset Managers and Financial Sectors from across the globe in one place. The RDS Dublin is a globally recognized venue with over 22,000 sq. meters of floor space throughout 4 halls, and is also conveniently located in the heart of the aviation leasing industry. During this conference you can expect displays from hundreds of exhibiting companies showcasing their products and services such as MRO & Composites, IT & Technology, Engines, Interiors, and Finance. Networking events include a day of golf at the Druids Glen Hotel & Golf Resort, a drinks reception and the Aviation 100 Global Awards. STS Component Solutions has been nominated for the 2017 Supplier of the Year Award during the ceremony. We hope to earn your votes and bring this prestigious award back to our main office in Palm City, Florida! Members of STS Aviation Group, Craig Duncan (Regional Sales Director, STS Component Solutions), Jim Naylor (Director of Sales, STS Component Solutions), Mark Robertson (President of STS U Jet) and Aidan O’Leary (Managing Director, STS U Jet) will all be available to meet with during the conference to discuss any of your company’s aircraft component & interiors service and support requirements. This conference is sure to provide opportunities to develop new partnerships and generate business between key airlines, purchasers, MROs, and aircraft component & interiors suppliers within the EMEA region and beyond. Be sure to fly by Stand D131 during the exhibition and meet the STS team. We really look forward to seeing you all in Dublin!